Chapman is sponsoring a four-day symposium on the premiership of Margaret Thatcher. The Thatcher Symposium is free and open to the public. Sessions will be held in the evening from 7 to 9 pm from Tuesday, April 30, until Friday, May 3, in Bush Conference Center, Beckman Hall. Tuesday, April 30: "The Anglo-American Alliance at the End of the Cold War"
Wednesday, May 1: "Thatcherism: Free Market Economic Policy"
Thursday, May 2: "Thatcherism: Rolling Back the Frontiers of the State"
Friday, May 3: "The Grocer's Daughter and Her Legacy"
There will be a display in the library entitled Churchill to Thatcher: British Prime Ministers in the Cold War, which will be opened formally at a high tea on the afternoon of May 1. Despite efforts by Attorney General Ashcroft and others to stifle debate and ignore critical questions over the serious issues pertaining to terrorism, the Independent Institute, a public policy research and educational organization, will host a special event with world-renowned author Gore Vidal to address the terrorist war based on his new book, Perpetual War for Perpetual Peace: How We Got to Be So Hated, on April 18. Co-sponsored by Harper's Magazine and moderated by its editor, Lewis Lapham, this Independent Institute program will also feature a response panel of distinguished scholars: Barton J. Bernstein (Professor of History, Stanford University), Robert Higgs (Senior Fellow, The Independent Institute), and Thomas Gale Moore (Senior Fellow, Hoover Institution). The program will question the comforting yet largely unexamined consensus that the attacks on the World Trade Center and the Pentagon are incidents unconnected to long-standing U.S. policies that may well be courting a truly catastrophic sequel to the events of Sept. 11. The participants will further explore other critical questions given short shrift, such as why--after retaliating against the Al Qaeda terrorist network and its Taliban enablers--the Bush Administration now speaks of "bringing justice" to an "axis of evil" countries not involved in the 9/11 attacks--while Osama bin Laden and most of the major terrorist leaders remain at large. *Why, despite spending $1.5 trillion over the past five years, constituting 36 percent of global military spending in 1999, and exceeding the combined military budgets of the ten nations that rank immediately behind it, the U.S. failed to protect Americans and the Pentagon on 9/11. *Why, in the wake of Sept. 11, politicians have awarded billions in corporate welfare to the airline, agriculture, steel, insurance, and other industries; and White House tom-toms call for record increases in military spending. *Why federal agencies have acquired broad, new police powers to systematically spy on and detain both Americans and foreign nationals without due process. *Whether the "War on Terror" will ultimately stop terrorism or further facilitate a pork-feeding frenzy by special interests to the detriment of the public and the Bill of Rights. *Could U.S. policies be both provoking the hatred behind the murderous 9/11 attacks and increasing the prospects for more ominous threats to the safety of Americans and people around the globe? If so, how can we produce a safer world? Born at the U.S. Military Academy in West Point, New York, and raised in the Washington D.C. home of his grandfather, Oklahoma Senator Thomas Gore, Gore Vidal is a cousin of Al Gore and was brother-in-law to John F. Kennedy. The recipient of the National Book Award, Mr. Vidal is the author of twenty-two novels, numerous plays, television scripts and screenplays, and eight non-fiction books. The non-profit, non-partisan Independent Institute regularly sponsors in-depth studies of major social and economic issues, the results of which are published as books and studies, and form the basis for its numerous conferences and media programs. WHEN: Thursday, April 18, 2002, 8:00 p.m.
Theatre doors and bookstore open at 7:00 p.m.
WHERE: The Herbst Theatre, 401 Van Ness Avenue, San Francisco, CA Directions: Driving and parking directions available online at: http://www.performances.org/theaters/herbst.asp Or take BART to the Civic Center Station. The conservative Club for Growth has bestowed its first-ever Republican in Name Only (RINO) awards, mocking "Republican office holders around the nation who have advanced egregious anti-growth, anti-freedom or anti-free-market policies." Tennessee Gov. Don Sundquist's attempts to enact a state income tax made him the RINO of the year, and Rep. Greg Ganske (Iowa) and Sen. John McCain (Ariz.) took honors in the House and Senate, respectively. The Club for Growth, which has often infuriated GOP leaders by supporting conservative candidates over moderates in primary elections, issued a newsletter outlining the reasons behind its decisions. Ganske's support for managed-care reform as well as the federalization of airport security screeners qualified him as the "best Republican friend in Congress" of House Democratic Leader Richard A. Gephardt (Mo. ), according to the release. McCain's backing of the same airport security and health care bills, along with his opposition to President Bush's tax cut plan, made him "a surprise recruit in the Democrats' class warfare attack squad." Ganske, who is challenging Sen. Tom Harkin (D-Iowa) this year, said he received a 100 percent rating from the American Shareholders Association and an 85 percent rating from Americans for Tax Reform; the Club's president, Steve Moore, sits on both groups' boards. Suggesting the irony of the Club criticizing Republicans, Ganske said, "My guess is the Club for Growth is very interested in replacing Tom Daschle with Trent Lott," referring to the two parties' respective Senate leaders. "And I aim to help them do that." Larry Klayman's Judicial Watch, which bedeviled the Clinton administration with subpoenas, depositions and court suits, has achieved a modest victory in its new role as a watchdog over Republican fundraising activities. The organization released a letter from the office of investigations at the Department of Health and Human Services indicating that its complaint about public officials speaking at closed-door fundraising briefings conducted by the National Republican Congressional Committee had struck a nerve. James A. Kopf, director of the HHS office of investigations, wrote that he and other department ethics officials pressed the NRCC to "make corrections to their solicitation letters and agenda [and] the NRCC agreed to do so." Accompanying the letter is a release from the NRCC saying that "executive branch officials who are scheduled to moderate sessions . . . [were identified] by their official government titles without their knowledge or permission. These individuals will appear solely in their personal capacity and are not permitted to disclose nonpublic information. In view of this clarification, contributors who desire a refund may request one." Among the Republicans listed for the closed briefings held March 13-14 were intelligence committee Chairman Porter J. Goss (Fla.), Assistant Commerce Secretary Maria Cino and Assistant Energy Secretary Dan Brouillette. Klayman described the event as "the lowest of the low: selling national security briefings for campaign cash." Cyber-policy guru and Congress' chief anti-terror cop said March 26 he fully expects another terrorist attack on the homeland, but added he opposes knee-jerk security measures that do little real good while infringing greatly on civil liberties. Former Virginia Gov. James Gilmore, now the head of a congressionally appointed anti-terror commission, told an audience at the Johns Hopkins University Applied Physics Laboratory in Laurel, Md., that a national ID card would be "too creepy for me." We cannot, Gilmore said, "let the terrorists redefine our society for us." 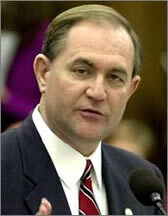 Gilmore's post was created by Congress in 1999 but became much more critical after the Sept. 11 attacks in New York and Washington. "It (Sept. 11) created an environment of change in American society and culture," he said. "A change for the worse." Gilmore said intelligence gathered by law enforcement authorities indicates that terrorists are attempting to develop programs that infiltrate and disable U.S. computer systems. "I'd be shocked if we didn't have another attack  it would be so easy," he said. "But I think we have to recognize that you cannot allow the enemy the power to compromise our essential values and freedoms." The idea for a national identification system that would require citizens to carry an ID card with his or picture on it and perhaps biometric proof like a fingerprint or retina scan has gained a foothold since the events of Sept. 11. Proponents say such a system would help consolidate existing federal, state and local databases and tighten border and airline security by effectively tracking lawbreakers and illegal aliens. Harris Miller, the president and CEO of the International Technology Association of America, said that while he doesn't think an ID card is necessary, he believes that creating a national database, much like the Social Security number issued to everyone in order to be employed is necessary and does not hurt freedom. "Like it or not, to paraphrase, it's the database, stupid," said Miller, who joined Gilmore and other technology experts in the debate. "A card, as a stand-alone, is not the answer." He said Americans give up their personal information everyday when they apply for a job, a driver's license, a credit card or even make a purchase over the Internet. So why not for security, he wondered? "It'll be even easier to share information, we would have the ability to give that person at the American Airlines counter the ability to access multiple databases and watch lists," he said. Marvin Langston, a vice president with SAIC (Science Applications International Corporation) agreed and suggested a voluntary ID card. "We need to find models that will work," Langston said. "I wouldn't mind having a card that got me through airport security in one minute." Critics of that idea contend if it were easy enough for the Sept. 11 hijackers to get fake driver's licenses and passports then it would be equally easy for them to get fake national IDs? "These (terrorists) are people who would have made it their business to get a national ID card if there was one to be had," said Gilmore. James Lucier, a senior analyst with Prudential Securities, said the technology industry was moving towards an architecture in which massive amounts of personal information  whether it be financial, medical or criminal  could be widely shared, even before Sept. 11. The issue is whether the information is secure and whether government should have unfettered access to it in the name of national or homeland security. Lucier suggests that the harm to privacy from such access would outweigh its potential law enforcement benefits. "Government agencies are not really good at keeping good lists of people who are actively seeking to evade the system  but they are good at maintaining lists of law-abiding citizens who are paying their taxes," he said. "I think the government that puts trust in citizens will probably have more access to the info it really needs for public safety and security than a government that makes trust impossible," he said. Gilmore said he is concerned that Americans are needlessly being forced to believe they must give up their fundamental rights for the benefit of security. He said that has already happened with the advent of traffic light cameras to stop errant motorists and surveillance cameras on the streets. "I don't think we should teach Americans that they should get used to being watched," he said. "It runs against the American grain." Asked in an interview with Newsweek magazine if he would do it again, Clinton said, "probably not, just for the politics." "It was terrible politics," he said. "It wasn't worth the damage to my reputation. But that doesn't mean the attacks were true." A list of 177 pardons and clemencies was released by the Clinton White House just hours before Clinton left office and George W. Bush was sworn in on January 20, 2001. The House Government Reform Committee, headed by a longtime Clinton foe, Rep. Dan Burton, R-Indiana, said in a report last month that it thinks Rich's pardon "raised substantial questions of direct corruption, primarily whether pardons were issued in exchange for political and other financial contributions."